Guests at the the sold out July 2017 Vegan Social Event enjoyed delicious food + beverages, musical entertainment, a raw cooking demo by Chef Doug McNish, interactive demos and good vibes all around! On July 16, 2017, Vegan Social Events, by Love Wild Live Free, hosted a vegan food + drink tasting and yoga event in partnership with Tiké, benefiting Community Living Ontario, a not-for-profit organization that supports individuals with intellectual disabilities. The venue was presented in partnership with Shecosystem Coworking + Wellness, a coworking community and event venue where feminist entrepreneurs can succeed in business without compromising their wellbeing. A selection of raw vegan artisanal cashew cheeses by Zengarry. Photo by Alex Bez, See Behind Walls Photography. This incredibly well received and sold out event brought together influencers, media makers and the local vegan and yoga communities for a celebration of Toronto’s thriving vegan scene! 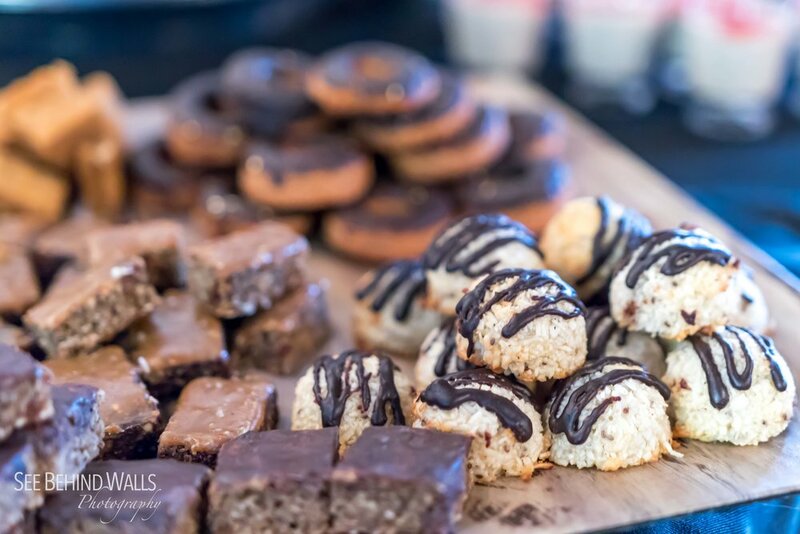 What made this Vegan Social Event unique to the Toronto vegan scene was that tickets not only included admission to the event, but also complimentary food + beverages, PLUS a swag bag with an estimated value more than $170! Gorgeous Fruit and Vegetable bouquets were provided by Beets & Roses. Photo by Kristy LaPointe + Plant Based Kristy on Instagram. Special guest executive vegan Chef Doug McNish presented a cooking demonstration featuring a delicious raw Pad Thai dish! (To see footage of his demo check out the Two Market Girls video below at the 1:25 point). The event also featured a live musical performance by the talented singer, songwriter and entertainer Alexandria and DJ set by Syrus. Tiké founder and yoga instructor Tania Koulakian also lead a wonderful, by-donation gentle flow yoga class prior to the social portion of the evening. The evening included interactive and complimentary demos for guests to enjoy. Shelby of Shelby Naturals hosted a beautiful spa station featuring her vegan skincare line made with ultra-pure, organic ingredients. Fruit and Vegetable Floral Artist Beets & Roses set up a unique interactive demo where guests created the most adorable veggie boutonnieres. We also had Mukta Being join us in showcasing their line of socially responsible, eco-friendly cork yoga mats and yoga accessories. The event also featured early bird prizes, generously provided by Ambrosia Natural Foods, Manitoba Harvest Hemp and Shirt Activism Apparel. In addition, we teamed up with Kupfert & Kim for a giveaway leading up to the event and they featured the event (and some sweet photos we took together) on their Instagram page which you can check out here! View the full photo album on Facebook here! Special guest executive vegan Chef Doug McNish. Photo by Snapd Annex/Yorkville - Zolen Georgievska. Photo by Alex Bez, See Behind Walls Photography. 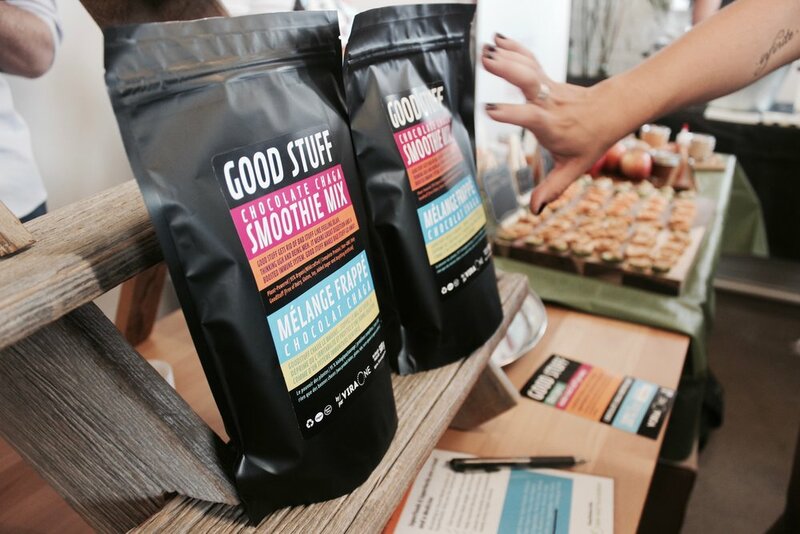 The Two Market Girls shared this lovely video recap of the Yoga + Toronto Vegan Social Event! Make sure to subscribe to their YouTube channel for quick and delicious vegan recipes that anyone can make and anyone will love! Guests mingled with inspirational, vegan influencers who are all game-changers, trendsetters and leaders in our local vegan scene! We were very excited to have had the following influencers in attendance at this event: Anne-Marie Campbell AKA the Meat Free Athlete and creator of Shirt Activism Apparel, vegan influencers Maddie Lymburner and Kyle Fraser, Devin & Katherine of Two Market Girls, Kristy LaPointe AKA Plant Based Kristy, Vegan Eats Toronto, Stacey Ottman of Cured By Plants, Jazmin Aron of Kai Vegan TV and Veganthropologie, Toronto-based animal rights activist Alex Bez of See Behind Walls Photography, professional vegan makeup artist Danielle Schleese and Lara Alice of Lara Alice Yoga. The food and drink offerings exemplified just how satisfying and flavourful vegan options can be. Guests enjoyed a variety of delicious vegan cheeses, healthy bites, guilt-free treats and thirst-quenching beverages too. Sweet treats by The Fix + Co. Photo by Alex Bez, See Behind Walls Photography. Ice cold RISE Kombucha! Photo by Kristy LaPointe + Plant Based Kristy on Instagram. RawFoodz debuted their NEW Chocolate Pudding at the Vegan Social and it was a huge crowd pleaser! Photo by Michelle Cass. VegNature joined us from Quebec with their selection of delicious vegan cheeses. Photo by Kristy LaPointe + Plant Based Kristy on Instagram. 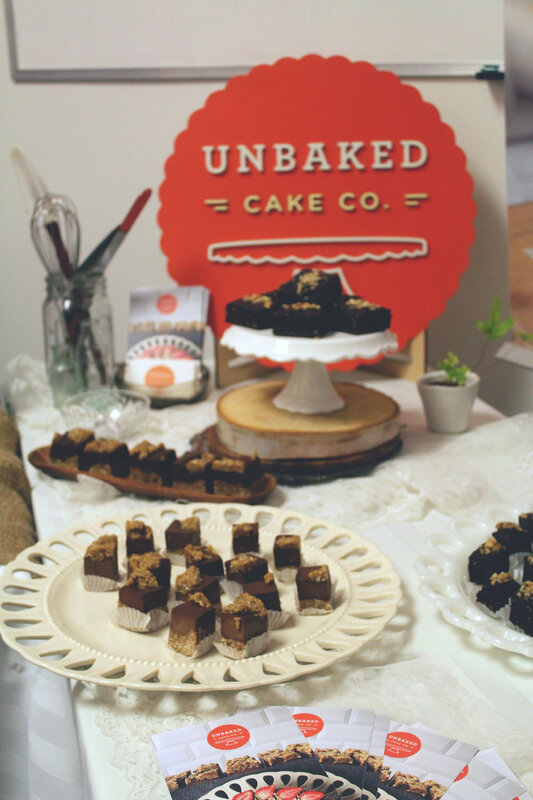 Goodies c/o Unbaked Cake Co.! Photo by Two Market Girls. Mama Vegan's cheese selection was on point! Photo by Alex Bez, See Behind Walls Photography. Ripple Foods. Photo by Two Market Girls. Two Bears Coffee. Photo by Alex Bez, See Behind Walls Photography. Delicious raw crackers from NudFud. Photo by Alex Bez, See Behind Walls Photography. Manitoba Harvest Hemp Foods served up their Toasted Hemp Seeds, Hemp Bites and freshly popped popcorn topped with their Hemp Oil and a selection of Hemp Toppers! Photo by Alex Bez, See Behind Walls Photography. GoodStuff by ViraOne. Photo by Kristy LaPointe + Plant Based Kristy on Instagram. These are just a few of the photo highlights. You can view the full photo album with more of our vendors on Facebook. Please credit the individual photographers (noted in the description of each photo) when sharing and/or using these photos. All of the guests went home with incredible swag bags, jam-packed with vegan goodies and valued at over $170! The swag bags included food, beauty and skincare products, fitness class passes, product vouchers, and more. Some of the goodies found in the swag bags! Photos and styling by Avra Epstein of Love Wild Live Free. Two Market Girls + check out their YouTube channel too! Photo highlights have been included above. You can view the full album on Facebook. Please credit the individual photographers (noted in the description of each photo) when sharing and/or using these photos. Thank you to everyone who helped make this event a success! I love and appreciate all who were involved. It was so inspiring to see so many great people from our vegan community come together for the evening. Stay tuned for details on the next Toronto Vegan Social Event, scheduled for September 7, 2017. Please feel free to get in touch via my Contact page for inquires regarding upcoming events. This Toronto Vegan Social Event and this post was in collaboration with all of the companies and individuals listed above. All of the products were kindly gifted for the event. I only share products that I personally use and that are made with the highest integrity.